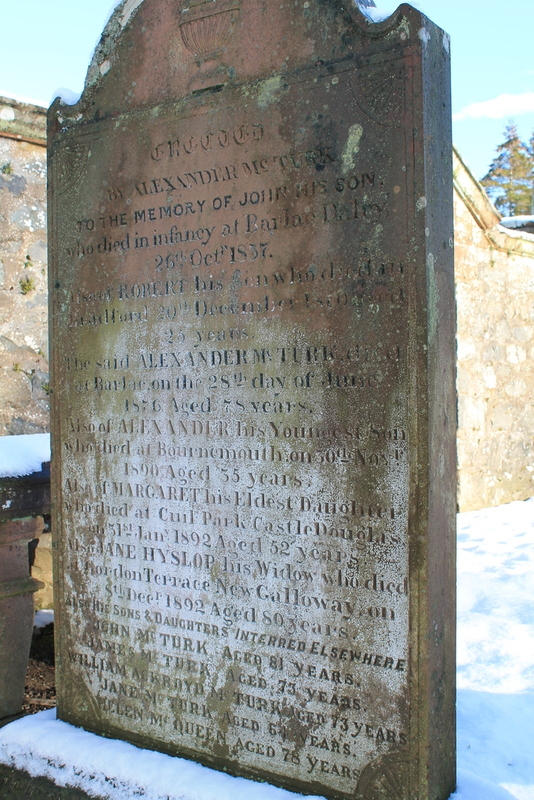 Erected by Alexander MCTURK to the memory of John his son, who died in infancy at Barlae, Dalry, 26th October 1837. Also of Robert his son who died in Bradford 20th December 1870 aged 25 years. 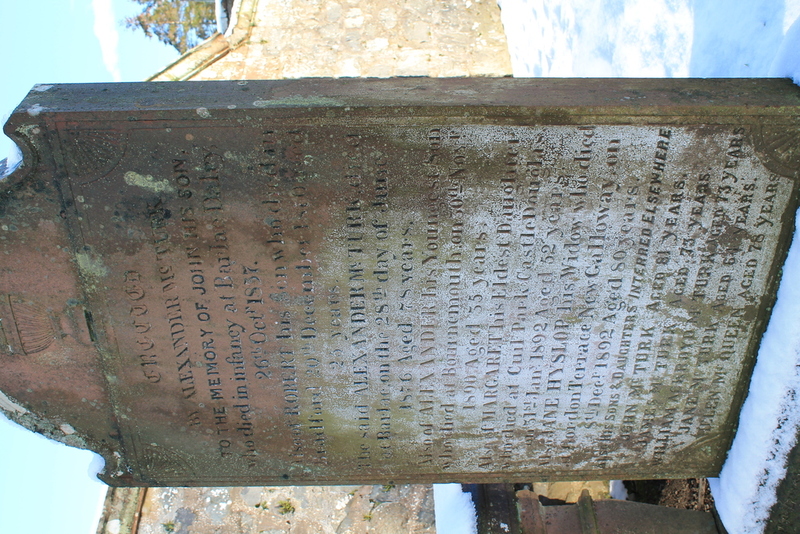 The said Alexander MCTURK died at Barlae, on the 28th day of June 1876 aged 78 years. Also of Alexander his youngest son died at Bournemouth on 30th Nov. 1890 aged 35 years. Also of Margaret his eldest daughter who died at Cuil Park Castle Douglas, on 31st Jan. 1892 aged 52 years. Also Jane HYSLOP his widow who died at Gordon Terrace New Galloway, on 8th Dec. 1892 aged 80 years. Also his sons & daughters interred elsewhere. John MCTURK aged 81 years. James MCTURK aged 73 years. William ACKROYD MCTURK aged 73 years. Jane MCTURK aged 64 years. Helen MCQUEEN aged 78 years. GC, “Kirkyard gravestone 198,” Carsphairn Archive, accessed April 21, 2019, http://carsphairn.org/CarsphairnArchive/items/show/226.